A MalaRae custom design is very special because it is a unique piece that encompasses who you are. Please be sure to read about our custom design options before proceeding to make sure this is the right one for you. 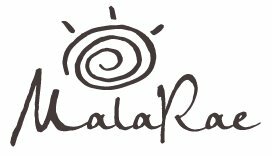 I have purchased two malas from MalaRae. The first is made of beautiful aventurine, tigerseye, and jasper. I really felt like the piece chose me. The quality of the fabrication is excellent. I have had the piece for nearly a year and it looks just as beautiful as the day I received it. The energy of the piece hasn’t waned over time either; you can tell it was created with passion and true intention. I felt so great wearing the first mala, that when I became pregnant, I purchased a second that was created with amethyst and moonstone. The mala radiates calming energy, and I feel calm and at peace when I wear it. Both came in beautiful packaging, and were delivered quickly. I have had so many compliments on both malas, and don’t hesitate to recommend MalaRae to anyone looking for a quality piece made with love.